Attorney Debra S. Frank has established a strong reputation as a family law attorney. A certified specialist in the area of family law, Attorney Debra S. Frank has spent her career doing more than simply keeping up with the law — she has been a force in shaping it. Debra S. Frank is committed to meeting the unique needs of each family law client. Part of this approach involves being sensitive to clients' needs, recognizing the financial and emotional stress that often accompany divorce, child custody, alimony and related matters and trying to reach a cost-effective resolution of their matters. 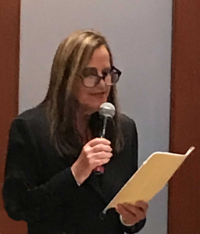 Attorney Debra S. Frank offers a unique combination of experience, knowledge and professional resources to assist individuals in the West Los Angeles area, as well as from the greater Los Angeles area and San Fernando Valley. By encouraging communication and remaining accessible throughout family law proceedings, Attorney Debra S. Frank remains dedicated to client satisfaction. Her clients come from the diverse Los Angeles community, including business, real estate, legal and financial professionals, as well as those in the entertainment and sports industries. Named by Southern California Super Lawyers magazine as one of the top attorneys in Southern California for 2009-2019. Board Member and Associate Journal Editor, Association of Certified Family Law Specialists. Spirit of CEB Award for service and contribution. Past Chair of the Los Angeles County Bar Association Family Law Section. Served on the Board of Governors of the Beverly Hills Bar Association and past Chair of its Family Law Section. Served on the Board of Governors of the Century City Bar Association and past Chair of its Family Law Section. Served a three-year term on the Family Law Section Advisory Commission advising the Board of Legal Specialization as to certification requests and assisted in drafting and grading exams. Past Chair of Financial Issues South Subcommittee of the State Bar Family Law Executive Committee. The subcommittee reviewed and reported to the State Bar Family Law Executive Committee on proposed legislation pertaining to financial issues. Former Board Member, State Bar Family Law Executive Committee and current Contributing Editor, State Bar Family Law News. Former Commissioner and Vice-Chairperson of the California Law Revision (Appointed by Governor Jerry Brown). Her extensive involvement in the family law legal community enhances her knowledge of family law and understanding of the family law legal system. Find out about the firm's practice areas, including divorce, alimony, child support, paternity, domestic violence, litigation and more. Attorney Debra S. Frank is able to utilize her resources, network of experts and understanding of the law to her clients' benefit to be an effective advocate. Contact her West Los Angeles law office today.